Montalcino has a wide selection of hotels and B&B's. If you happen to travel without a car, make sure you book a room in town. Accommodation (hotels and farm-stays) in the countryside are hard to get to as public transport is scarce. However, there is a selection of great Brunello wineries that can be reached on foot from the town center (check the Montalcino winery map for more info). 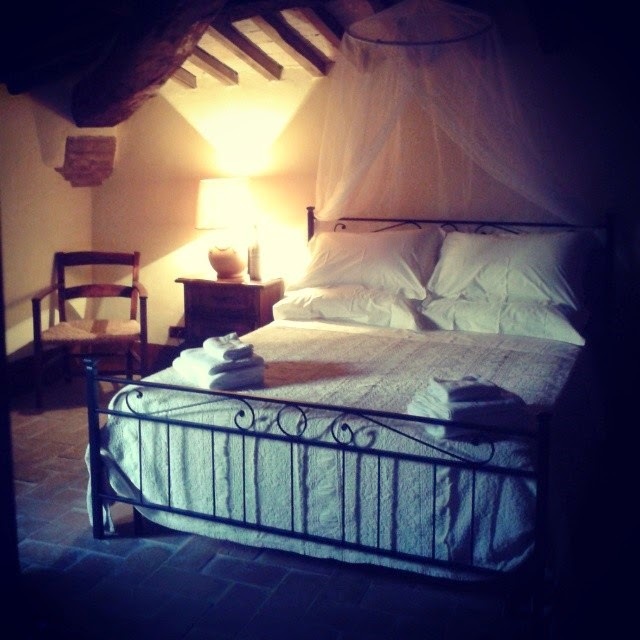 PORTA CASTELLANA proves that a B&B doesn't have to be plain and simple. Lovely rooms and generous outside spaces. In easy walking distance from Montalcino's sights and private parking on the premises. Hotel IL GIGLIO - One of the oldest hotels in town, nicely renovated a couple of years ago it's still a great example of Tuscan hospitality. Aks for a room with a view onto the Orcia Valley. If you like frescoed ceilings, book a room at PALAZZINA CESIRA. The carefully restored building has been turned into a B&B, and will give you a great idea of how the better-off people used to live in Montalcino. Galleria Turchi: right in the center of Montalcino, great interiors and a panorama view over the Val d'Orcia. One apartment only, but my favorite choice if you can get it. The lovely owner ran Montalcino's first art gallery and the selected artwork and Corbusier chairs bear testimony to that era. If money is no issue, check out CASTELLO DI VELONA, which sports its very own thermal bath and some of the best views in Southern Tuscany. A selection of rooms have access to the precious hot water en-suite. Just what you need after tasting too many Super Tuscans. CASTIGLION DEL BOSCO - no hot springs; however a 18 - holes golf course, sumptuous private villas with pool and a very chic spa (one of the Ferragamo brothers is co-owner) and Castiglion del Bosco's own Brunello winery will make sure you're being properly spoiled. For a complete listing of Montalcino's hotels and guestrooms in B&Bs and Agriturismi (farm hotels), check out the website of Montalcino's tourist office. If you are looking for your very own Tuscan villa in the hills of the Val d'Orcia check out the fine properties for rent on Trust & Travel.